Just in time for summer, Cameron's Brewing Company proudly introduces the newest way to enjoy its brew - tallboy cans of lager. 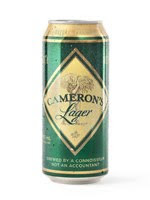 Winner of the silver medal at this year's Ontario Brewing Awards, Cameron's lager is fermented cold and long, using the finest Canadian malted barley for a crisp, smooth taste - the perfect refreshment for hot summer days. With new 473 mL tallboy cans, you can take this delicious lager anywhere! Pick up a case of 24 at selected LCBO and Beer Store outlets across the GTA. Winner of two 2011 Ontario Brewing Awards, Cameron's Brewing Company is a true craft brewery, passionately brewing all natural ales and lagers since 1997 in Oakville, Ontario, Canada. Its unique 9-packs of Auburn, Lager and Cream Ale allow for just a little more Cameron's in each box (6-packs of Dark 266 also available). Cameron's is currently available at The Beer Store, select LCBO stores in the GTA and across southern Ontario and on tap at many bars and restaurants. For more information about Cameron's and its availability, please visit www.cameronsbrewing.com.